The regular shell colour of farmed Litopenaeus vannamei is off -white to greenish-white but instances of L. vannamei with brown-shell colour do occur in farmed shrimp. Physically, except for colour, the white-shelled vannamei and brown-shelled vannamei appear similar. 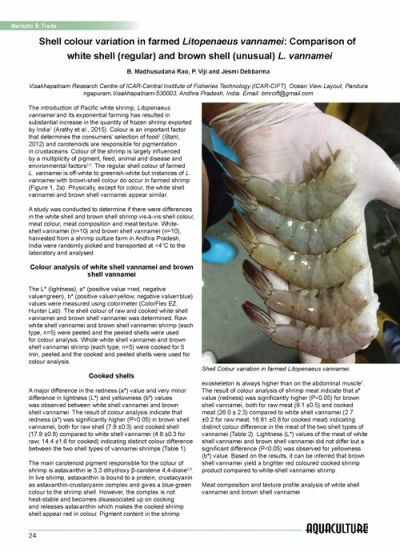 A study was conducted to determine if there were differences in the white- and brown-shelled shrimp vis-à-vis shell colour, meat colour, meat composition and meat texture. 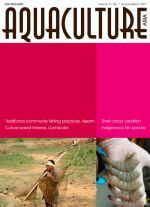 White-shelled vannamei was determined to be better in terms of meat composition and texture profile but brown-shelled vannamei yielded a more brightly red-coloured cooked product.